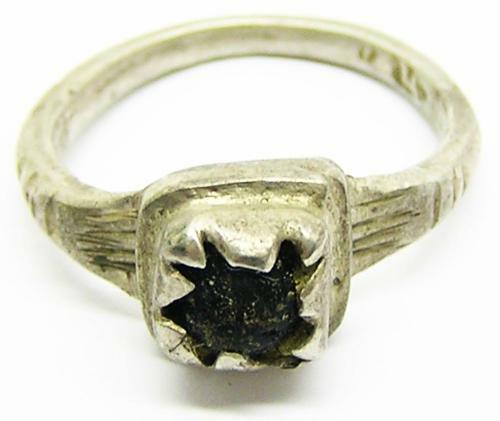 This is a Renaissance silver finger ring, dating to the 16th century A.D. The ring is set with the original glass gem, held within a box-shaped bezel. The shoulders decorated with linear strokes (possibly once enameled). It bears a worn makers mark inside the robust band, this appears to be a letter 'n' or 'L'. Such a ring would have been worn by a merchant during the period of King Henry VIII and King Francis I. Today it has survived in excellent excavated condition, suitable to be worn again today.